Bioshock is one of my favourite videogames of all time so when a new game in the series was announced I was excited....that game of course being Bioshock 2 which really was not as bad as people made out! 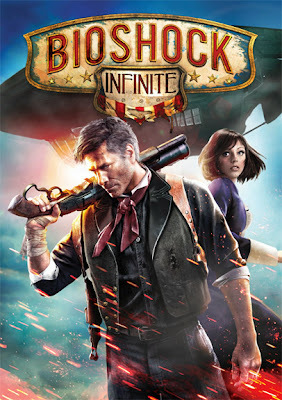 Bioshock Infinite came next, released earlier in the year to much critical acclaim and actually created by the first party studio. 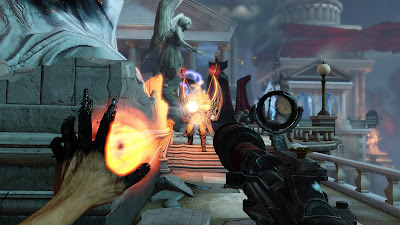 Where Bioshock took place in the undersea city of Rapture after its society had imploded into violence Bioshock Infinite takes place in the floating city of Columbia and starts off with its society intact, albeit sitting on a powder keg of unrest. 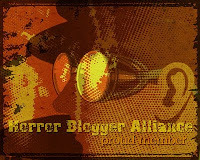 Mild spoilers folllow! Towards the end of the 19th Century a floating, travelling city named Columbia was created as a display of American exceptional-ism, the city, run by its founder; the prophet Zachary Hale Comstock. During the Boxer Rebellion of 1899 the city brutally intervened which led to the American Government asking for the city to be recalled. Comstock seeing this as a sign of weakness and betrayal refused and instead declared Columbia no longer under American rule, the city then disappeared into the sky. 1912 and Booker DeWitt is told if he travels to Columbia and rescues a girl imprisoned there then all his gambling debts he owes to some very bad people will be wiped clean. His arrival sets off a chain of events that lead to open revolution against Comstock and his followers by the downtrodden who have united under the banner of the Vox Populi. 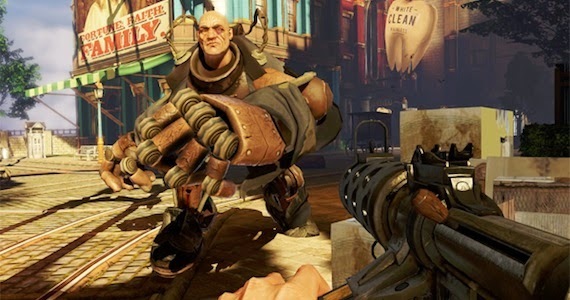 Now Infinite is pretty much gameplay wise a retreading of Bioshock. You have the same sort of weapons that again can be upgraded, you have magic (Plasmids previously, now called Vigors) that let you set enemies on fire, summon a bunch of attacking crows, turn hostile machines onto your side etc. You travel linear levels collecting money and food off the floor, listening to recordings you find and battling fantastical creations (Infinite even has its own version of Big Daddies, though these hulking machine men are nowhere near as iconic). The floating city is a neat idea and is well realised, sky rails dotted around the game let you travel them opening up combat opportunities. So gameplay wise this is nothing new but it is the story part that really sticks with you. 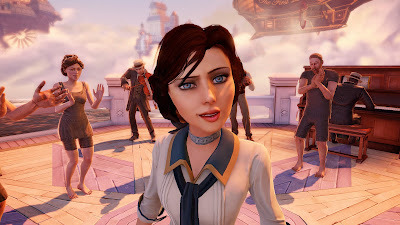 For much of the game you have a young woman Elizabeth with you as a friendly A.I. She is able to open up 'tears' in the fabric of time and space that give you glimpses into alternate realities and times (also able to do this in combat to give you access to friendly machines and items to utilise). Elizabeth is a amazingly well crafted character. The plot gets really interesting when you start to explore alternate realities. Columbia goes from being an idyllic place (though one with intense racist ideals) to a war zone and you can't help shake the thought that it is all because of your actions. Playing Bioshock I always wondered what it would have been like to see the fall of Rapture, here you actually get to witness first hand the fall of Columbia. Both sides; the racist ruling elite, and the poor, harshly treated working class who unite under the banner of the murderous Vox Populi are despicable people. At one point DeWitt (fully voiced throughout) comments that maybe the destruction of Columbia is what everyone deserves but I disagree, it was a beautiful place, much like I imagine Rapture had once been. The plot goes to some brain melting wonderful places and is what really stuck with me from the game, days later I just can't stop thinking about how wonderfully the story plays out. My main criticisms of the game number quite a few points. First off this is a very violent game. Now I love violence but the initial outbreak took me by surprise with just how brutal Booker is, his character is one that at times seems alien to me, he does horrific things during fixed sequences that I as a player was perplexed at and would not have done myself. Vigors are never really explained, seeing as how they are nearly all used for violent means it seems strange that Columbia would have need of them, they feel kind of out of place. Falling into the same trap that Bioshock 2 did the locations start off fantastic and fall downhill. Up to just over halfway though the game I loved everywhere I went. The fair, Battleship Bay, the Hall of Heroes, the fantastic factory and slums areas; all great, all full of colour and vibrancy. After the midway point though everything seems to grow larger, get darker, more grey and brown, it looses its sense of being real. Giant constructs that seem to exist merely for fighting through such as large Greek palaces and flying ships take away from the other settings. Usually I would never say this but if a largish slice had been cut off the later part of the game you would not have heard me complaining! As an end note on this the re-using of assets detracts greatly, the same few posters and paintings are used far too often everywhere you go. There is nothing to rival the Big Daddy monster of Bioshock but still some cool enemy design is used. The Patriot (a walking robot that resembles either George Washington, Abraham Lincoln or Comstock) is awesome, the under used Songbird is very well designed also while the human enemies are varied. Fun to fight if a little easy (that is what harder difficulties are for) You can now do finishing moves on enemies which seems a bit too over the top. Your Vigors though not really needed are fun, the electricity attack for instance can cause heads to pop, while using a possession attack on an enemy causes them to kill themselves Syndicate style in remorse after they have served their purpose. I could speak for thousands more paragraphs about this game, it is very memorable. Bioshock Infinite is a stellar game, extremely interesting story and a great sense of it being a real place (the early parts of the game let you soak in the world, interacting with friendly citizens). Unlike its ancestor though it is not one I am desperate to jump back into anytime soon, well worth the journey at least once though.